In this issue of Crochet Now : Crochet Now is dedicated to bringing its readers the patterns they really want to make, in yarns which are not only fabulous, but readily available and affordable. 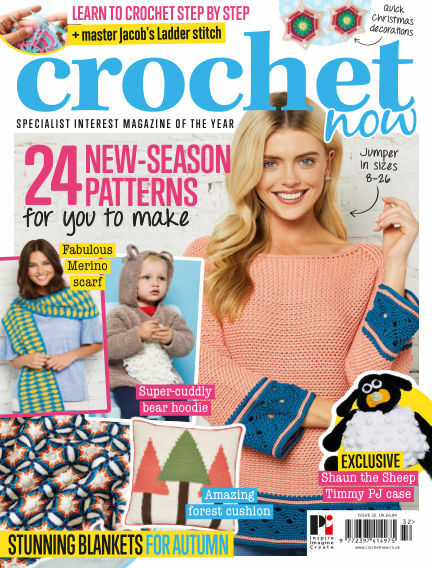 Each issue packs in over 25 patterns showcasing colour and the latest crochet trends in popular projects such as blankets, toys, quick accessories and baby makes, as well as great regular features to truly master crochet techniques. Ask our experts for clever ways to beat the most common crochet problems, find step-by-step guides to hold your hand through your next project and even join in with our Crochet Along with top designer Jane Crowfoot. Made by crocheters for crocheters, Crochet Now really does promise to be the UK’s number one magazine for crochet patterns. With Readly you can read Crochet Now (issue ISSUE32) and thousands of other magazines on your tablet and smartphone. Get access to all with just one subscription. New releases and back issues – all included.